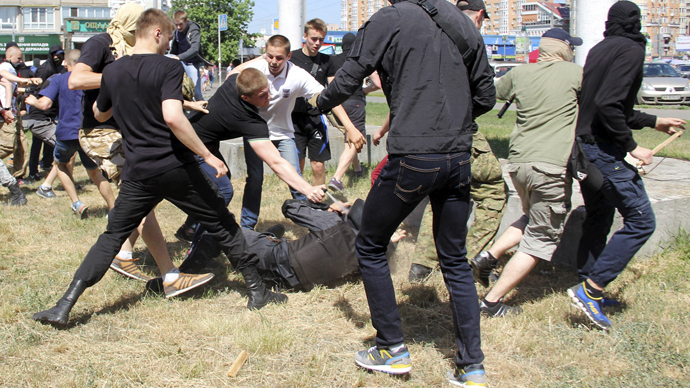 Up to 30 assailants who attacked a gay rights march in Kiev were arrested on Saturday as scuffles broke out between members of the Ukrainian LGBT pride march and their fiercely nationalist opponents. The march of around 300 LGBT supporters reportedly lasted for only half an hour and came under attack despite the presence of police in riot gear. The attackers hurled flares, smoke bombs and teargas at the crowd walking along bank of the Dnipro River. Ten radicals, three law enforcement officers and four marchers have been injured, RIA Novosti reported. The Equality March is the fourth that the LGBT community intended to have in the Ukrainian capital, but only the second they actually managed to hold, the first taking place in 2013, when police ensured the safety of the participants. Kiev Mayor Vitaly Klitschko earlier advised that the event be canceled due to a threat of violence from the Pravy Sektor (Right Sector) nationalist group which had threatened to disrupt the protest. But the organisers nonetheless decided to proceed with the "March of Equality." "This march shows that we exist. We are fighting for equal rights that, unlike others in Ukraine, we currently lack," a 31-year-old woman told AFP. "I am very frightened," she said, adding: "But I am also very proud of myself - proud that I came out and so many people supported us." With the conflict in eastern Ukraine under way, Kiev has been seeking a closer alliance with Europe to promote civil liberties widely enjoyed overseas. Ukrainian President Petro Poroshenko told a press conference on Friday that although he won't participate in the "March of Equality," he doesn't "see any reason to impede this march because it's a constitutional right of every citizen of Ukraine." Right Sector leader Dmytro Yarosh, in contrast, complained on his Facebook post on Thursday that LGBT communities have been boosting the scale of their activities in Ukraine. "Even as the fighting in the East has intensified, they plan a series of measures including their 'mini gay parade' - "March of Equality". It's not just an activity aimed at the moral decay of the Ukrainian people, it's spitting on the graves of those who died fighting for Ukraine, and on the living defenders of the Motherland too," Yarosh wrote. "LGBT usually position themselves as defenders of ‘innocent victims’ who suffer from 'homophobia'," the Right Sector leader said. "In reality, they practice a very aggressive ideology that doesn't tolerate dissent." "Thank God, we remain a rather conservative nation," Yarosh wrote, adding that "propaganda of homosexuality and gender ideology has been reinforced by the West." "In addition to funding relevant organizations and programs, the West exerts serious pressure on the current Kiev authorities to force them to actively implement LGBT ideology. Now, think about whether Ukraine needs this integration, when someone imposes its will on us? " Yarosh said.